I’ve always wanted a ring. It doesn’t have to be an engagement ring or wedding band, and I certainly don’t imagine a guy getting down on one knee. I’ve just always wanted a ring. Last summer, much to my surprise, I found it! I was browsing along the Rocky Neck Art Colony, not at all in the market for jewelry, when I wandered into Alma’s Arts & Antiques. 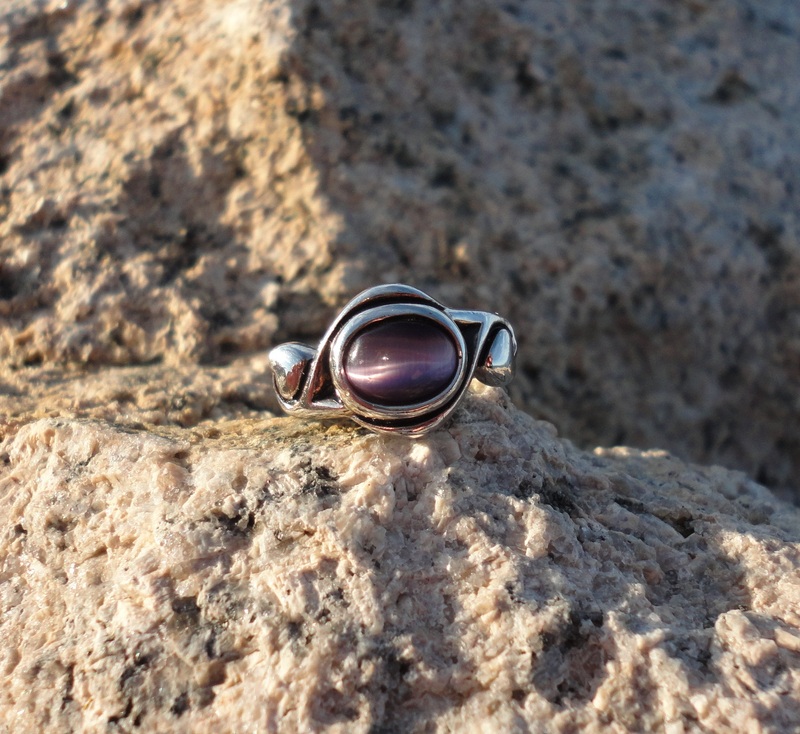 I spied this purple cats eye stone, accented on each side with heart drops, and an expandable silver band. Not only was it well within my price range, it was utterly cheap. When people ask me about the ring, the first thing I do is take it off and let them see it. I paid less than $10 for it, and I’m pretty sure my uncle Jeff (a jewelry designer) would be ashamed to know that I’m outfitted with such junk. But in twelve months’ time, I have not dropped it down the bathroom sink nor has it turned my finger green. So I’m determined to keep wearing it! I was intentional about buying the ring, and I intentionally wear it on my left hand ring finger – but all for pretty superficial reasons. First, I think it’s a pretty ring and I like the way it looks on me. It goes well with my style and complements my other jewelry. Second, I’m right-handed. I would much prefer to wear a ring on my left hand, because I don’t like getting it caught on things when I’m writing or washing dishes. Finally, the ring reminds me of my trip to Gloucester. I can recount many significant moments there, although none of them are specifically tied to the ring itself. I wish I had some wonderfully thought out, theologically astute, and spiritually enriching answer to why I wear the ring. To be perfectly honest, I didn’t have a good answer whatsoever, until I made a spontaneous remark a few weeks ago at Theology on Tap. Someone asked about the ring again, and I could hear the caution in her voice. “I wanted to ask you about the ring …” she said. Afraid of what she might say next, I quickly pulled it off my hand. I told the story of where I bought it, and then I said, “It’s kind of funny actually, because this is not the ring I would have chosen for myself. If I were the one picking out the ring, I would much prefer my birthstone, and I definitely would have selected a solid metal band.” She complimented me on the ring again, and much to my relief, we went on to talk about something else. The fact that this is not the ring I would have chosen for myself explains exactly why it is the perfect ring for me. 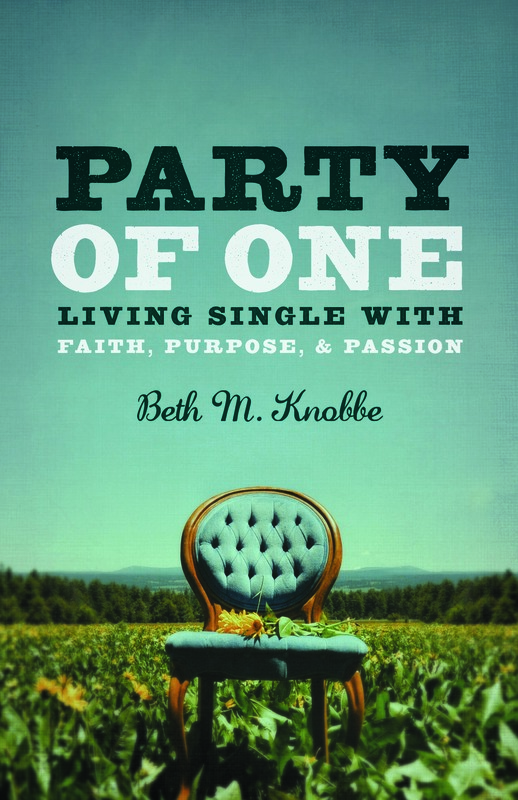 The single life is probably not the life I would have chosen for myself, but it is where God has called me to be. As I have allowed myself to embrace the single life with an open heart, I realize how mysteriously perfect God’s design is for me. There are times when I absolutely rejoice in being single! Other times I wonder, how did I get here?! As I reflect on some of the more significant decisions of my life … you know the ones, when two paths diverged in a yellow wood, and I had to make a choice. There are decisions in my life that I perhaps would not have chosen on my own, but it is so evident that God’s providence has lead me to the place I am today. If I had a choice, I would have gone to college at Creighton rather than Briar Cliff. It turned out that Creighton wasn’t a good fit; and Briar Cliff just felt like home. I followed my heart, and it was one of the best decision I ever made. I signed up to interview with three different internship supervisors for my M.Div. practicum, but the Sheil Center was not on my original list! God had something better in mind. Once I met the director from Sheil, all of the other options fell to the wayside. Eight years later, the rest is history! God willing, I will be going on a mission trip to Haiti later this year. (I’m so excited!!) But I didn’t choose Haiti; I did not go out seeking a mission to Haiti. Over the last year, I’ve had a deep sense that God was inviting me into something new. I’ve allowed my heart to be completely open and free, and as we discerned our next mission trip, all signs pointed to Haiti. Plans are now falling into place and I can feel my heart drawn more deeply there – not because it is Haiti per se, but because I know God is waiting there for our arrival. So, why do I wear a ring? I wear it because it reminds me that this is the life God has chosen for me. It reminds me of 40 days at Eastern Point Retreat House in Gloucester, Mass. and the powerful transformation that God began there. It reminds me to live in the present, to spontaneously wander into antique stores, to treasure moments of silence, and to linger a little while longer in chapels, forest preserves, and art galleries. It reminds me to live in trust and go wherever God calls, even if it is not the place I would have chosen for myself.